Requiem for a Heavyweight is a dour film, going with the dark and gritty world of prizefighting. There's a great hopelessness in it, a sense of despair, of people trapped with no way out of their misery. If not for some fine performances, it would be a film to avoid and forget. Luis 'Mountain' Rivera (Anthony Quinn) is facing the end of his boxing career. His manager, Maish Rennick (Jackie Gleason) and his cut-man, Army (Mickey Rooney) tell him as much, and now Mountain is forced to enter a world he does not fit into. To get employment, he eventually goes to the State Employment Agency, where he meets Grace Miller (Julie Harris). She at first isn't interested in Rivera's problems, but during the interview she sees the gentle, kind soul buried beneath the lumbering figure and funny voice. She helps set up an interview with people who run a camp in the Adirondacks, where she thinks he could work well with kids. Mountain seems eager to start this new venture, but fate, and Maish, have other plans. Maish has gotten deep into debt with Mobsters, who lean on him to pay back the $1,500 he owes when contrary to what he told them, Rivera didn't fall by the fourth round to Cassius Clay (the future Muhammad Ali playing himself). He needs it by the first of the month, and Maish has come up with the perfect solution: wrestling. Rivera is proud of never having taken a dive in any bout, but now Maish wants him to appear in wrestling, where there are definite dives. Even worse, he wants him to appear in costume as Big Chief Mountain Rivera, putting a coda on a humiliating comedown for our dimwitted but kind palooka. To insure Rivera has no chance for a better life, Maish gets him drunk before the interview. Rivera doesn't help his case by being extremely nervous when he gets to the interview and runs off. Grace runs after him and while there's no romance (an effort by Rivera would now be called assault) it's clear they have developed feelings for each other. Maish tells Grace to let Rivera go, and despite his objections, when he sees the danger Maish is in, Rivera gamely but reluctantly and tragically goes into his 'war dance', his humiliation complete. Requiem for a Heavyweight has two things going for it: Jackie Gleason and Julie Harris. 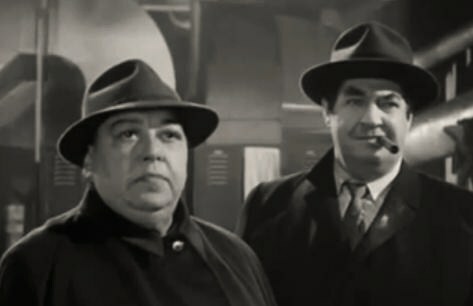 Gleason was, according to Gleason, dubbed 'The Great One', by none other than Orson Welles, and here we see that Gleason was extremely adroit at handling the drama, not shaking the sleaziness of Maish without making him slightly, slightly sympathetic. It's almost a pity that Requiem for a Heavyweight didn't center around Maish: his struggle to sell out the one person who genuinely loved him and thought the world of him due to his own greed. Harris played the part to perfection: starting from her very stiff, almost indifferent manner towards Rivera to slowly begin to see that Rivera should try for something better, something that would elevate him. It's a shame that director Ralph Nelson, returning from the original Playhouse 90 production, and Rod Serling (who wrote the original Playhouse 90 production as well) gave them only one scene together, where we see both of them making their own cases. For Grace, she believes Rivera has been beaten up enough, literally and metaphorically, and should go somewhere else to start over. For Maish, despite his financial stakes, he thinks Rivera has no future, and the idea of being a camp counselor is a pipe dream created by a do-gooder without any idea what it will mean to that mountain of a man. In the title role, Anthony Quinn is fine, and yet I never shook the sense that he was 'acting', that he was deliberately giving a performance versus being the character. Part of it is his choice of voice, where his mumbling and whispering sometimes were hard to hear and make out. Part of it is his manner: a little too confused and deliberately dim. In many ways, Mountain Rivers came across as more dim than sweet, more mannered than real. Worse off is Mickey Rooney. Where I once thought he was the moral conscience of Requiem for a Heavyweight, I find that his Army could almost be entirely written out of the film without affecting the story. For most of the film, Rooney just glowered disapprovingly at Maish or protectively at Rivera. Apart from that, Rooney didn't seem to have much to do in the film, which is a terrible shame. There were other elements that stuck out. One of the more bonkers one was to have the main Mobster be a woman: Ma Greeny (Madame Speevy). I don't remember if Madame Speevy was the original Mobster who had a great line to Maish: "It was a bet, not a bank loan", but seeing this rotund woman in drag and trying to be menacing came off as bizarre, almost hilarious. I think the fact that it came out of nowhere made the thing look a little strange, especially for 1962. However, this isn't to dismiss some positive elements in Requiem for a Heavyweight. The opening sequence where we see Rivera's point of view as The Greatest knocks him out is well-made. On the whole however, Requiem for a Heavyweight has more minuses than pluses. A downbeat ending, a couple of weak performances, and some off-the-wall moments push the film down. If not for Gleason and Harris' performances, it would have been much worse. They are worth watching. The film, not so much.